First Lady Melania Trump was all smiles at the White House’s annual Easter Egg Roll on Monday in an ensemble reminiscent of the 1970s when times were a bit simpler. First Lady Melania Trump stepped out of the White House on Thursday in a fuchsia coat and black stilettos as she and President Donald Trump greeted South Korean President Moon Jae-in and his wife Kim Jung-sook to Washington, D.C.
First Lady Melania Trump jet-setted across the United States on Monday for her three-state tour, strutting in and out of presidential cars in yellow tartan stilettos and a two-tone winter ensemble. First Lady Melania Trump was girly in a bright pink coat and a fresh tan on Wednesday as she and President Trump welcomed Colombia’s president and first lady to the White House. 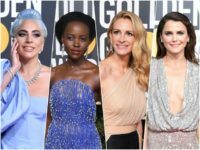 First Lady Melania Trump received a standing ovation at President Trump’s State of the Union Address (SOTU) as she contrasted starkly in style to the white-clad women of the Democrat caucus. 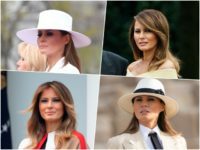 First Lady Melania Trump made 2018 the year she stepped out of her fashion comfort zone and took major style risks never before taken by a sitting first lady. 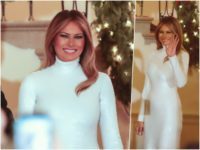 First Lady Melania Trump shaded the establishment media for their false claims that she and President Trump did not visit American soldiers on Christmas. 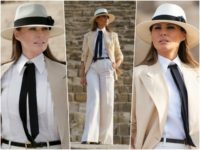 She’s the most fashionable First Lady the country has ever seen. The most striking. The most poised in modern history. This is Melania Trump. First Lady Melania Trump is classic for the Christmas holiday, wearing an assortment of navy ensembles and her favorite brands of luxury stilettos. First Lady Melania Trump was welcomed and beloved by children at the Children’s National Hospital in Washington, D.C. on Thursday, bringing holiday cheer in candy cane red stilettos. Throughout the week of mourning and Hanukkah celebration, First Lady Melania Trump remained elegant and graceful with her black wardrobe. 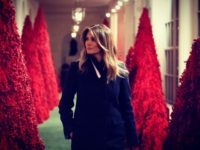 First Lady Melania Trump unveiled Christmas decorations this week, matching her red leather gloves to the stunning red trees adorning the halls of the White House. Meow! 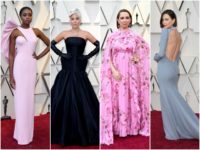 Mic’s fashion editor Evan Ross Katz gets a bit catty in an article about Breitbart News’s wildly popular Fashion Notes columns by John Binder which chronicle First Lady Melania Trump’s sartorial fabulousness.